Creativity Works provides creative courses and activities, which inspire and empower people to explore, develop and grow. Through our work we draw communities together and enable more people to access the arts, with a particular focus on those living with mental health challenges or facing difficulties in their lives. 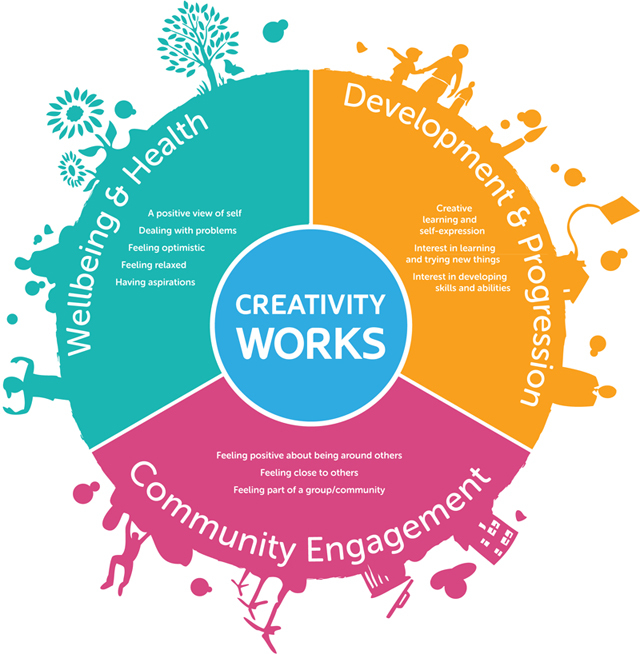 The Creativity Works model aims to make a positive difference in the lives of individuals across three main areas: Wellbeing, Development and Progression and Community Engagement. Wellbeing and Health: an increase in confidence; self esteem; optimism and positivity. Development and Progression: an increase in, or learning of new skills; a greater awareness of capacity; greater interest in exploring creative potential; an increase in trying new things. Community Engagement: a greater involvement in the group and engagement in activities; an increase in communication with others; more active in areas beyond the project.